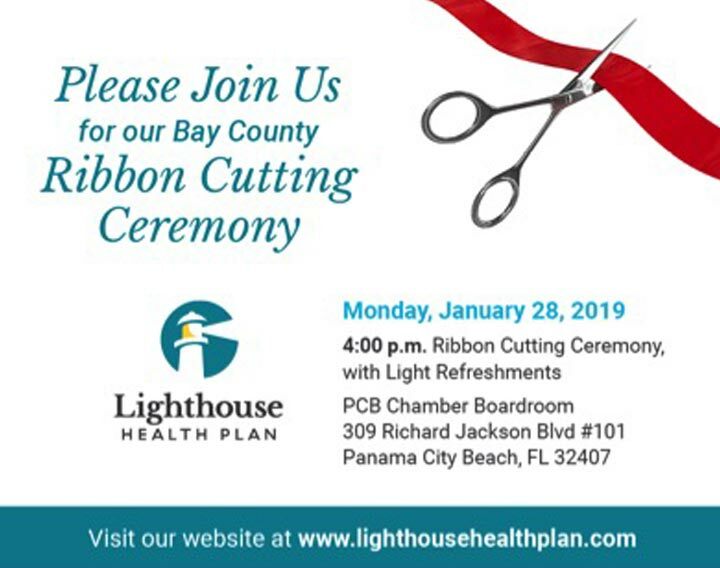 January 18, 2019 –Panama City Beach, Fl—To announce its upcoming launch, Lighthouse Health Plan is hosting a ribbon cutting ceremony at 4 p.m. on Monday, Jan. 28, at the Panama City Beach Chamber of Commerce Boardroom – 309 Richard Jackson Blvd., suite 101. Community leaders, physicians and healthcare stakeholders are encouraged to attend and meet the Lighthouse team and learn its mission and plans for Bay County. Lighthouse Health Plan is a community-based health insurance plan created and run by doctors. Lighthouse will begin providing Medicaid coverage to beneficiaries beginning February 1. This coverage is provided through a Managed Medical Assistance (MMA) plan run by the Agency for Health Care Administration (AHCA). Approximately 200,000 people in the Florida Panhandle qualify for Medicaid coverage. Of those, 70 percent are at-risk children. Lighthouse is partnering with a broad network of doctors, hospitals and other providers to serve Medicaid beneficiaries. Thousands of providers have already joined the Lighthouse network. These organizations are coming together because of the need for a more coordinated, lower cost care for Medicaid beneficiaries that are locally based.